Setting off for a day out at Sheaf Park, in Sheffield, I stopped off to grab a quick on-the-go breakfast. Well, as fast as on-the-go, but drawing the whole darned thing allows! 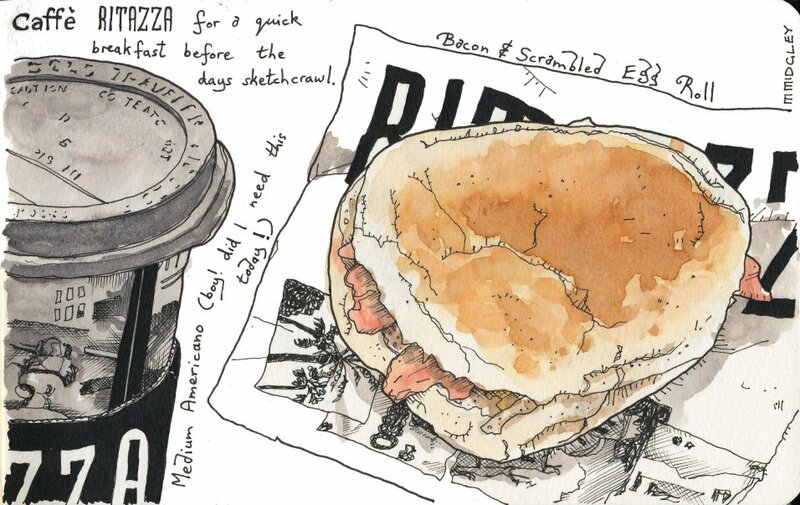 I liked the way that the paper bag that Cafe Ritazza put my bacon and egg roll in was half obscured by the sandwich and the contrast with the purely black and white coffee cup. Hi there – I really love this drawing. I am part of the Community Management team for Caffe Ritazza and we loved the way you interpreted our breakfast sandwich. Can we share this? I’m glad you liked my interpretation 🙂 Of course you may share my drawing; and just in case it isn’t clear from my drawing; I do as much of the drawing and painting on site, before eating and drinking! HI Matt – that is really amazing. You are so talented!! We have shared your artwork… and are so grateful. Would you ever consider doing an exhibition of your work IRL? Further, can we invite you back for lunch – I would love to watch you work. Thanks again, Stephenie, glad to hear you’re enjoying my drawings. Regarding IRL; I have had some works exhibited last year; a joint venture between myself and another couple of artists in my local town. The exhibition was a celebration of the town. We are due to exhibit next year in another town; where I was planning on using some of my restaurant drawings to help illustrate the diversity of cultures. I’d love to pop round for lunch; that sounds great 🙂 Send me an email and we’ll see what we can do.